← Expectations vs. Law of Attraction…Who Wins? Do you feel really worried you’ll forget something important because there are so many things to do and you can’t remember all of them? Or are you doing that already? Are you missing deadlines? Afraid it’s a symptom of something bigger? Sometimes our mind gets so bogged down that we can’t think straight and we need a little help. Before you freak out, try this. Write down every single thing you need to do as it occurs to you. A yellow pad works great, or typing it up…but if you keep adding to it at odd times, a yellow pad is the way to go. You might want to make two columns or put it on separate pages if you have a work and a home life list. How to start? Just go for it! Empty out your mind of all the things rolling around in it that needs to be done. Work, kids, errands, you name it. I have one for my business and one for everything else. If you think of something at night you need to do and the list gets long, and in the morning you thing…uh oh…what did I want to do? It seemed so important last night… hmmmmm….. Having the pad next to your bed or at least a small pad that you can transfer the info from to your main list can be a game changer. And you’ll sleep better too! You get the idea. You might want to underline or star those of extra importance or that have a date connected to it – like the anniversary gift. If you were separating out, you’d move the research and the Facebook ads to a separate page or column. Sometimes you might even write out a whole page in one sitting. One thing leads to another and as your mind empties, more and more ideas come forth of things you forgot you needed to do, but which … someone … might be nagging you about doing that you just never get to. If you try this you should find that your mind becomes quieter and any stress you feel over forgetting anything just melts away. 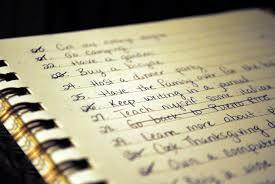 If you cross off things as they get done, you’ll feel a great sense of accomplishment too – an added bonus! One hint, keep your list generally in the same location so you don’t have to hunt for it when you want to write something down. And at some point, rewrite your list picking up the couple of things that are left to do, as well as all the new things so that it doesn’t get too messy and you miss a couple of things at the beginning that you didn’t get to yet. If you already are a list maker, this is just a gentle reminder to start doing it again if you’ve let it lapse, and if you aren’t give this a try! It may just become your new best friend.